Cancer of the supraglottis (supraglottic cancer) is almost exclusively squamous cell carcinoma (SCC). This article discusses the anatomy of the supraglottis, explains the staging of supraglottic lesions, and provides an overview of treatment options. During the past 150 years, the treatment of supraglottic tumors has progressed significantly. In 1852, Horace Green reported the first surgical resection of a laryngeal lesion, a polyp in the ventricle, removed under direct vision. By 1859, the first transcervical resection of an epiglottic neoplasm was reported. Chevalier Jackson revolutionized supraglottic surgery in 1915, when he used a laryngoscope and a punch biopsy to remove an epiglottic tumor. Alonso first described conservation surgery for cancer of the supraglottic larynx in 1947, and, in 1958, Ogura formalized the procedure as the supraglottic laryngectomy. [2, 3] During the 1950s, the surgical microscope and endotracheal anesthesia were brought to bear on this disease. In the 1970s, the carbon dioxide laser began to be used for supraglottic tumors. SCC of the supraglottis is seen less frequently than cancer of the glottis, and is treated differently from tumors of the glottis or subglottis. Because of its location, the disease and its treatment can affect the function of the larynx, including speech, swallowing, and breathing. Laryngeal cancer is the 11th most common cancer in men worldwide but is much less common in women. Men have been reported to have as much as 30 times the risk that women have for this disease. Older individuals are also at a higher risk for laryngeal cancer; the highest number of diagnoses is made in patients age 60-74 years. Generally, the international occurrence of SCC is proportional to tobacco and alcohol use. In societies in which tobacco is chewed rather than smoked, tumor location favors the oral cavity rather than the larynx. Numerous studies have correlated smoking of tobacco products with SCC of the larynx. In fact, some studies have show that97% of patients with laryngeal cancer smoked. When compared with men who did not smoke, men who smoked at least 1.5 packs of cigarettes per day for more than 10 years were found to have a 30-fold increased risk of developing laryngeal cancer. Studies with controls for age, race, and smoking habits also suggest that consumption of alcohol increases the risk of laryngeal cancer. Alcohol consumption has been shown to have a synergistic effect with smoking; thus, the risk of developing carcinoma of the larynx is increased 100-fold in individuals who both smoke and drink. This may be partly due to the fact that alcohol serves as a solvent for the carcinogens of tobacco. In 1946, Slaughter developed the theory of field cancerization in tumors of the head and neck. In essence, this theory posits that the entire mucosa of the aerodigestive tract, when exposed to the same toxins, risks development of carcinoma. The vulnerable epithelium undergoes progressive changes that lead to malignancy as exposure to toxins continues. Hence, multiple areas of precancerous change can give rise to synchronous lesions. Supporting this theory is the high rate (4%) of synchronous lesions found upon workup of patients with lesions of the upper aerodigestive tract. Dietary deficiencies, radiation exposure, human papillomavirus (HPV), and gastroesophageal reflux are other factors associated with laryngeal SCC. The supraglottis is embryologically derived from the buccopharyngeal anlage in the region of the third and fourth branchial arches. The glottis and subglottis originate from the tracheobronchial anlage in the region of arches 5 and 6. Hence, the larynx virtually consists of 2 hemilarynges, each with different embryonal derivation and largely independent lymphatic circulation. Despite the theoretical separation of the supraglottis from the rest of the larynx, no anatomical or histological barrier has been identified. Furthermore, supraglottic tumors invading the paraglottic space have access to the glottis via the medial surface of the thyroid cartilage. Due to the fact that supraglottic patients with SCC often present with nodal disease, palpation of the neck is important. Physical examination may reveal laryngeal or cervical findings. Examination with a laryngeal mirror or a flexible nasopharyngoscope aids in visualization of supraglottic lesions. The supraglottic larynx is partitioned into 4 subdivisions, as follows: (1) aryepiglottic folds, (2) arytenoids, (3) false cords, and (4) epiglottis. For tumor-staging purposes, the epiglottis is further subdivided into suprahyoid and infrahyoid regions. These areas of the supraglottis are structured within the framework of the supraglottic larynx, which includes the upper half of the thyroid cartilage, the arytenoid cartilages, and the epiglottis. In the image below the vocal fold, epiglottis, aryepiglottic fold, and arytenoids are seen. A surgical specimen after laryngectomy. The arrow points to the vocal fold. Note the epiglottis, aryepiglottic fold, arytenoids, and false folds superior to the arrow. Supraglottic squamous cell carcinoma (SCC) follows a predictable pattern of spread. Although tumors may extend inferiorly to involve the vocal folds and subglottis, invasion more often occurs in adjacent sites outside the larynx such as the base of tongue, vallecula, pyriform sinus, and postcricoid region. As the disease progresses, tumors of the supraglottis tend to metastasize to regional lymph nodes. Jackson C. Malignant diseases of the epiglottis. Peroral Endoscopy and Laryngeal Surgery. 1915. 438-9. Alonso J. 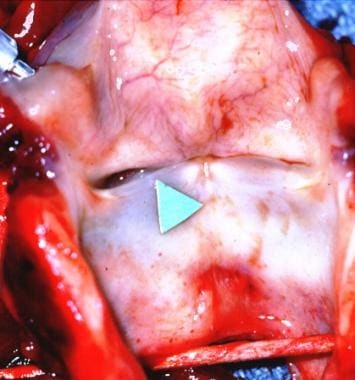 Conservation surgery of cancer of the larynx. Am Acad Ophthalmol Otolaryngol. 1947 Jul-Aug.
Chu EA, Young JK. Laryngeal cancer: diagnosis and pre-operative work-up. Otolaryngol Clin N Am. 2008. 41:673-695. Parkin DM, Bray F, Ferlay J, et al. Global cancer statistics, 2002. CA Cancer J Clin. 2005 Mar-Apr. 55(2):74-108. [Medline]. Morales-Angulo C, Val-Bernal F, Buelta L, et al. Prognostic factors in supraglottic laryngeal carcinoma. Otolaryngol Head Neck Surg. 1998 Nov. 119(5):548-53. [Medline]. De Stefani E, Boffetta P, Deneo-Pellegrini H, et al. Supraglottic and glottic carcinomas: epidemiologically distinct entities?. Int J Cancer. 2004 Dec 20. 112(6):1065-71. [Medline]. Slaughter D. Multicentric origin of intra-oral carcinoma. Surgery. 1946. 20:133-46. Lin JY, Li XY, Dong P, Nakashima T. Prognostic value of lymphangiogenesis in supraglottic laryngeal carcinoma. J Laryngol Otol. 2011 Sep. 125(9):945-51. [Medline]. Lopchinsky RA, Amog-Jones GF, Pathi R. Ultrasound-guided fine needle aspiration diagnosis of supraglottic laryngeal cancer. Head Neck. 2011 Aug 8. [Medline]. National Comprehensive Cancer Network. National Comprehensive Cancer Network Practice Guidelines in Oncology, v.2.2008, Section: SUPRA. [Full Text]. The Department of Veterans Affairs Laryngeal Cancer Study Group. Induction chemotherapy plus radiation compared with surgery plus radiation in patients with advanced laryngeal cancer. N Engl J Med. 1991 Jun 13. 324(24):1685-90. [Medline]. Forastiere AA, Goepfert H, Maor M, et al. Concurrent chemotherapy and radiotherapy for organ preservation in advanced laryngeal cancer. N Engl J Med. 2003 Nov 27. 349(22):2091-8. Reizenstein JA, Holmberg L, Bergqvist M, Linder A, Ekman S, Lödén B, et al. Time trends in T3-4 laryngeal cancer - a population based long term analysis. Head Neck. 2013 Oct 25. [Medline]. Liu YH, Du ZW. Management of clinically negative nodes (N0) in supraglottic laryngeal carcinoma: A systematic review. Genet Mol Res. 2016 Oct 17. 15 (4):[Medline]. Yılmaz T, Suslu N, Atay G, Gunaydın RO, Bajin MD, Ozer S. The effect of midline crossing of lateral supraglottic cancer on contralateral cervical lymph node metastasis. Acta Otolaryngol. 2015 May. 135 (5):484-8. [Medline]. Grant DG, Salassa JR, Hinni ML, et al. Transoral laser microsurgery for carcinoma of the supraglottic larynx. Otolaryngol Head Neck Surg. 2007 Jun. 136(6):900-6. [Medline]. Csanády M, Czigner J, Vass G, Jóri J. Transoral CO2 laser management for selected supraglottic tumors and neck dissection. Eur Arch Otorhinolaryngol. 2011 Aug. 268(8):1181-6. [Medline]. Suárez C, Rodrigo JP, Silver CE, Hartl DM, Takes RP, Rinaldo A, et al. Laser surgery for early to moderately advanced glottic, supraglottic, and hypopharyngeal cancers. Head Neck. 2011 Apr 15. [Medline]. Fink DS, Sibley H, Kunduk M, et al. Functional Outcomes after Salvage Transoral Laser Microsurgery for Laryngeal Squamous Cell Carcinoma. Otolaryngol Head Neck Surg. 2016 Oct. 155 (4):606-11. [Medline]. Peretti G, Piazza C, Penco S, et al. Transoral laser microsurgery as primary treatment for selected T3 glottic and supraglottic cancers. Head Neck. 2016 Jul. 38 (7):1107-12. [Medline]. Peretti G, Piazza C, Mora F, Garofolo S, Guastini L. Reasonable limits for transoral laser microsurgery in laryngeal cancer. Curr Opin Otolaryngol Head Neck Surg. 2016 Apr. 24 (2):135-9. [Medline]. Agrawal A, Moon J, Davis RK, et al. Transoral carbon dioxide laser supraglottic laryngectomy and irradiation in stage I, II, and III squamous cell carcinoma of the supraglottic larynx: report of Southwest Oncology Group Phase 2 Trial S9709. Arch Otolaryngol Head Neck Surg. 2007 Oct. 133(10):1044-50. [Medline]. Cabanillas R, Rodrigo JP, Llorente JL, et al. Oncologic outcomes of transoral laser surgery of supraglottic carcinoma compared with a transcervical approach. Head Neck. 2008 Jun. 30(6):750-5. [Medline]. Rodrigo JP, Cabanillas R, Franco V, et al. Efficacy of routine bilateral neck dissection in the management of the N0 neck in T1-T2 unilateral supraglottic cancer. Head Neck. 2006 Jun. 28(6):534-9. [Medline]. Sevilla MA, Rodrigo JP, Llorente JL, et al. Supraglottic laryngectomy: analysis of 267 cases. Eur Arch Otorhinolaryngol. 2008 Jan. 265(1):11-6. [Medline]. Dünne AA, Davis RK, Dalchow CV, et al. Early supraglottic cancer: how extensive must surgical resection be, if used alone?. J Laryngol Otol. 2006 Sep. 120(9):764-9. [Medline]. Cagli S, Yuce I, Yigitbasi OG, et al. Is routine bilateral neck dissection absolutely necessary in the management of N0 neck in patients with supraglottic carcinoma?. Eur Arch Otorhinolaryngol. 2007 Dec. 264(12):1453-7. [Medline]. Brandstorp-Boesen J, Sorum Falk R, Folkvard Evensen J, Boysen M, Brondbo K. Risk of Recurrence in Laryngeal Cancer. PLoS One. 2016. 11 (10):e0164068. [Medline]. [Full Text]. Nicolai P, Redaelli de Zinis LO, Tomenzoli D, et al. Prognostic determinants in supraglottic carcinoma: univariate and Cox regression analysis. Head Neck. 1997 Jul. 19(4):323-34. [Medline]. Petrakos I, Kontzoglou K, Nikolopoulos TP, Papadopoulos O, Kostakis A. Glottic and supraglottic laryngeal cancer: epidemiology, treatment patterns and survival in 164 patients. J BUON. 2012 Oct-Dec. 17(4):700-5. [Medline]. Carvalho AL, Nishimoto IN, Califano JA, Kowalski LP. Trends in incidence and prognosis for head and neck cancer in the United States: a site-specific analysis of the SEER database. Int J Cancer. 2005 May 1. 114(5):806-16. [Medline]. Hoffman HT, Porter K, Karnell LH, et al. Laryngeal cancer in the United States: changes in demographics, patterns of care, and survival. Laryngoscope. 2006 Sep. 116(9 Pt 2 Suppl 111):1-13. [Medline]. Cosetti M, Yu GP, Schantz SP. Five-year survival rates and time trends of laryngeal cancer in the US population. Arch Otolaryngol Head Neck Surg. 2008 Apr. 134(4):370-9. [Medline]. Elegbede AI, Rybicki LA, Adelstein DJ, et al. Oncologic and Functional Outcomes of Surgical and Nonsurgical Treatment of Advanced Squamous Cell Carcinoma of the Supraglottic Larynx. JAMA Otolaryngol Head Neck Surg. 2015 May 7. [Medline]. [Guideline] Jones TM, De M, Foran B, Harrington K, Mortimore S. Laryngeal cancer: United Kingdom National Multidisciplinary guidelines. J Laryngol Otol. 2016 May. 130 (S2):S75-S82. [Medline]. [Full Text]. Histological specimen of squamous cell carcinoma (SCC).